In an essay on Moses Maimonides entitled “The Literary Character of The Guide to the Perplexed,” Leo Strauss suggests that we read Maimonides as we would read a good novel: we should look for textual contradictions and read into the relationship of one “chapter heading” to another. 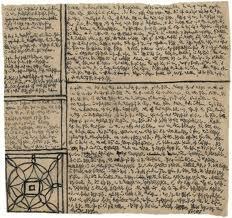 In other words, he believed that Maimonides was communicating secrets to Joseph – Maimonides student for whom he dedicates The Guide to the Perplexed – by way of allusions. There is a precedent for hinting at secrets in the Talmud. It points out that secrets regarding the Maaseh Merkavah (the “Work of the Chariot,” an allusion to Ezekiel’s famous chariot) and Maaseh Bereshit (the “Work of Creation”) should neither be communicated in public nor directly. They are private teachings and they can only be alluded to in the teaching itself. Reading Robert Walser’s “Fritz Kocher’s Essays,” I cannot help but think of Strauss’s reading. To be sure, Walser’s chapter headings are well-placed and are very suggestive of a secret that Walser wishes to communicate to his readers. The secret he wishes to communicate is deeply entrenched in the space between childhood and adulthood and it is published in the wake of death. To be sure, this space and post-mortem situation inform the framework through which these fictional “essays” are communicated: as I pointed out in a previous blog entry, these essays are written by a boy on the cusp of manhood and it is published in the wake of his death by someone who found them worthy of sharing. And, as I noted, this framework suggests a tradition which is being passed from person to person by way of allusion. In this blog entry, I’d like to briefly address the first three chapter headings – together with their contents. I find compelling evidence in them that a secret is being alluded to, a secret that is to be found between the spaces of youth and adulthood. Within these spaces, the question of what it means to be human is addressed in an esoteric manner. But the esoteric is cloaked by way of the comic. Following this, Kocher is distracted from the highness of man to what makes man so imperfect. In the midst of his meditation, which surely makes him feel a sense of horror, he makes a promise not to become an animal: “I promise loud and clear: I want to be a steady, upright person”(4). In this moment, we can see that Kocher has a conflict between being a “man” and being an “artist.” He sees the latter as immoral and punishable, but he doesn’t agree with this valuation. Since he doesn’t want to deal with this conflict, he changes subject and says that the one thing he fears most is “baseness.” But, after saying this, he goes off on tangent that contradicts this claim: he says he wants to be famous, meet beautiful women, etc and be reckless. For saying this, he says, right in the essay, that he will likely get an F for “writing like this” in an essay. But he is ok with this since “every word comes from the heart.” This, he says, is the most important thing about man: “if he wants to be human, he cannot do without it.” The intelligence of the heart is the greatness of man. However, after stating this, his thoughts turn to his fear of getting drunk and looking base. And from there he turns to the importance of being industrious. But, if we read properly, we can see that these concerns and everything in his essay is ancillary to being a person who has a heart. And the secret of this person, it seems, is that he (Fritz Kocher) is an artist. After thinking this, he starts thinking about how he can’t do math and how he would never want to be a businessman. Instead of counting apples, he’d rather have an apple for a grade. Perhaps Walser is suggesting that the artist is childish, full of heart, distracted, and self-conscious. We can find these suggestions between the chapters/essays depicting “man” and “autumn.” In contrast to the previous two essays, the next chapter/essay, entitled “The Fire,” is deadly serious and it lacks the distraction of the previous two. Moreover, in contrast to the other two, this essay comes with an image of a fire eating up a building. He isn’t an anti-hero so much as a hero who is barely visible. How does this fire and this “thin young” hero who “disappears without a trace” relate to Kocher’s desire to be an artist? Is Kocher an artist for remembering the fire and the person who saved the innocent from death? Is he an artist for thinking of the poor children who don’t have a home or warm slippers? These questions are to found in-between the chapter headings. And they suggest or allude to different answers. By reading Robert Walser like Leo Strauss would read Maimonides’ Guide to the Perplexed, we can see that Walser thinks there is wisdom to be found in the child’s reflections. However, they may also be reflections of a distracted mind. The best way to find out is, in a midrashic sense, figuring the relation between one chapter heading and another or between one distraction and another. In the next blog entry I want to address why, in the wake of this fire and its depiction, Kocher turns to the theme of friendship.